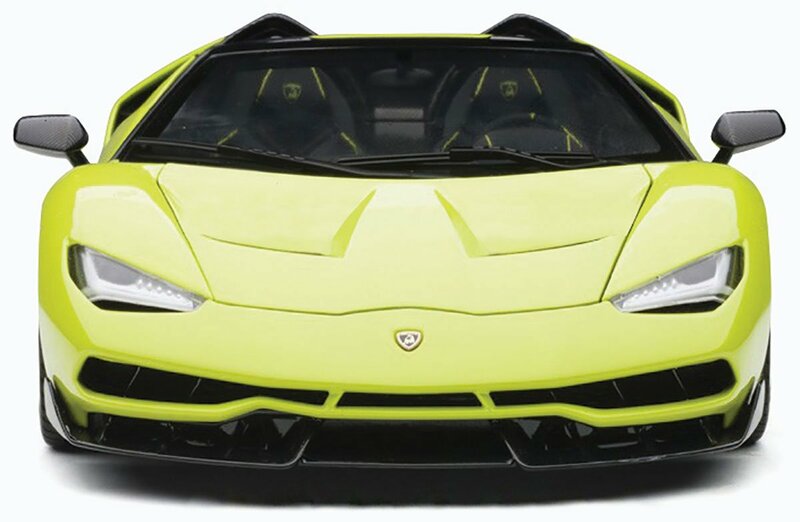 The Lamborghini Centenario is one of those rare cars that we think looks better as a roadster than as a coupé. AUTOart will shortly be releasing its 1:18 replica of the roadster, in four different colours. Lamborghini launched the Centenario at the 2016 Geneva Motor Show, to commemorate the 100th birthday of its founder, Ferrucio Lamborghini. The roadster was unveiled later that year, at the Pebble Beach Concours d’Elegance. In total, 20 coupés and 20 roadsters were produced. The Centenario was the first Lamborghini to be provided with rear wheel steering. It was also equipped with the Italian marque’s new infotainment system, which recorded the car’s telemetry and could be analysed on a 10 inch screen in the cockpit. Downforce was massively increased by having the front twin-deck splitter, side blades and massive diffuser at the rear all working in conjunction with each other. AUTOart’s 1:18 replica will come complete with opening bonnet and doors, and removable bodywork around the engine. The rear wing will also be adjustable. The only thing we don’t exactly know yet is what the RRP is going to be, as AUTOart never confirms this until a new model has practically arrived in our warehouse. For the moment we have it listed at £214.99; you will be charged the final RRP when it is confirmed by the model-maker.